Why: Resistance skills are critical. When it comes to changing any behavior it’s important to be able to say no. Learning how to say no effectively is one of the most important skills you can use as you work to improve your eating and exercise habits. 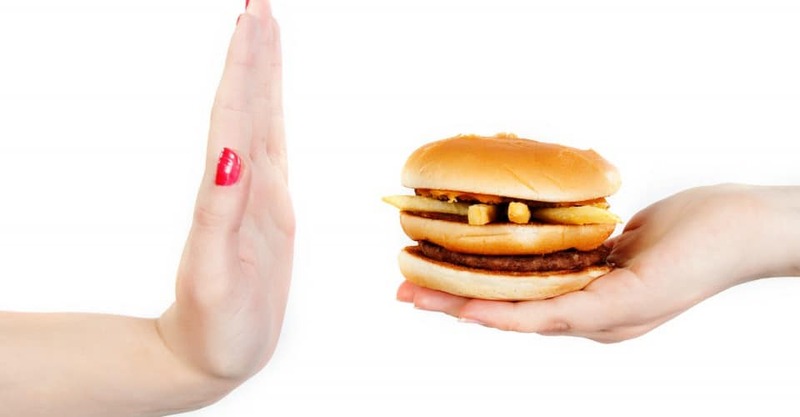 Say no to the food pushers, the diet saboteurs, the fast-food commercials and all those who try to derail your diet. The fact is, people won’t always be as supportive as you’d like them to be. Try writing down three typical scenarios you’ve experienced when you were around family, friends or co-workers and were made to feel uncomfortable saying no to food. The key is to prepare responses to these types of situations so you’re ready next time. That way, you’ll be armed with an automatic response – a response that rolls off your tongue because you’ve thought of it ahead of time and it makes sense! If you are prepared, there’s a better chance that you will be able to control the outcome. Why: I know that the “c” word is soooo passé. Been there, done that. I get it. However, #calories are a real measure of your food intake. Yes, a calorie is simply a combination of carbohydrates, protein and fat. And yes, there are the “right” proteins (i.e., lean), the “right” carbs (whole grains and veggies) and the “right” fats (e.g., unsaturated, omega-3s). But, the number of calories gives you an instant clue as to whether or not you have the budget to eat what you’re about to eat. Calories also help to keep you accountable. The word “calorie” may conjure up images of all the sinful foods you shouldn’t be eating, but you need to appreciate calories rather than considering them the enemy. Calories should be thought of as energy that keeps you going. The only problem is that if you eat too many of them, you end up stockpiling unused energy, and that’s what turns into fat. 3. What you need to know: You get a daily calorie budget. Fats are the most “expensive” at nine calories per gram. Carbs and proteins are four calories per gram. As a quickie guide to determining your calorie budget, figure 10 calories per pound for women and 11 calories per pound for men. Then multiply that number by your activity level (sedentary = 1.2, lightly active = 1.35, moderately active = 1.5, very active = 1.65, extremely active = 2.0). Reduce your calorie budget to lose weight. Know the cost of a calorie and shop wisely, because every 40 calories you take in over your calorie budget will require 10 minutes of walking to burn off. Why: While diet book authors and nutrition experts can’t agree on much, what they can agree on is that eating vegetables is a great diet and #health strategy. They are nature’s ultimate gift ­incredibly low in calories and high in nutrients. What more can you ask for? What you need to know: Just take a look at the following comparison: 100 grams, or 3.57 ounces, of broccoli is only 34 calories, while a 100-gram, or 3.57-ounce, brownie is 405 calories. So, from a calorie perspective, you can eat loads of broccoli and not get fat. That’s the concept of eating in volume; you can eat 10 times more non-starchy vegetables than junk food. Not only that, but you also get all those fabulous antioxidants and other nutrients. Why: A study by Rena R. Wing, Ph.D., professor of psychiatry and human behavior at Brown University, found that friends who followed a weight-loss program together lost more weight and were more likely to complete their diet program and maintain their #weight loss than those who were doing it on their own. What you need to know: It wouldn’t hurt to make a few new friends who are health and fitness conscious. Mind you, I’m not saying replace your old friends ­ just find a few who don’t carry that extra doughnut in their briefcase or purse. A critical factor in your potential for successful weight loss is the company you keep ­ that is, other people within your social environment. You need to examine whether your spouse, family, partner, friends and colleagues eat poorly and/or are sedentary. If so, you might want to widen (no pun intended) your social circle. Use online team-based weight-loss interventions such as http://www.healthywage.com/The-Matchup, or try forming a group at work. Why: Feeling confident that you can change a behavior is one of the single biggest predictors of being able to change. It’s called “self-efficacy” — the belief in your ability to “organize and execute” whatever behavior you would like to modify. It’s the confidence that we can attain what we want — and it’s especially important if you want to control your weight. What you need to know: The reality is that any behavior change is hard – and thinking you can’t do it even before you start makes it that much harder. So, avoid thoughts like “I can’t lose weight — it’s in my genes,” “I’ll never be able to exercise three times a week,” “I can’t eat at a restaurant without pigging out on the bread basket.” To build confidence you need to use affirmations. Telling yourself that you can do something is half the battle. If you think you can’t do something, there is a high likelihood that you will not be able to do it. Try to build confidence by educating yourself. For instance, if you want to start eating healthy at home, try taking a few healthy cooking classes. You can even rent or buy healthy cooking DVDs.